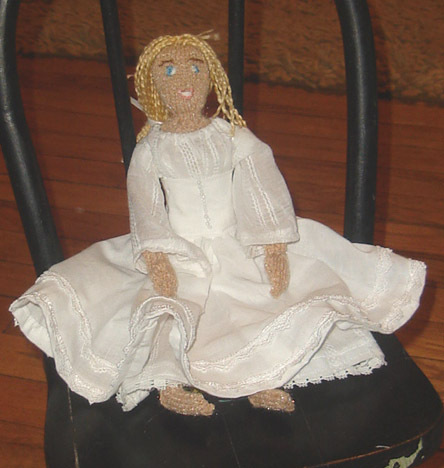 Blotch and Thrum: Crafts of the Past: knitted doll - Beatrice in "Much Ado about Nothing"
Crafts of the Past: knitted doll - Beatrice in "Much Ado about Nothing"
Or is it a knit doll? 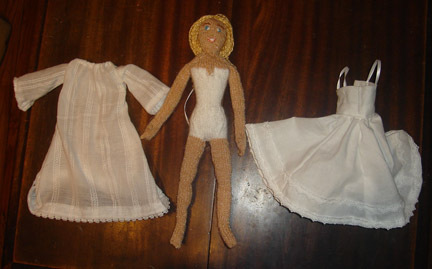 A lot of my early knitting was dolls, dolls and finger-puppets. I knit most of them flat and then seamed, because I didn't know how to knit in the round. Though knitting in the round makes life much easier. This one was knit when I knew better, and was knit in the round; her shaping was very much informed by sock knitting, with which I was and still am much enamored. I am especially impressed, looking at it now, 3 and a half years later (!) at how feet-like her feet look. Anyway, this is based on Emma Thompson in the Kenneth Branagh film of the play. I tried to take notes of my method, but quickly stopped, as usual, when it got complicated, which is sad, it would be fun to have a pattern. I do remember knitting it while waiting at the mechanics' for the car to be repaired... more than that, I don't know. Her dress is in two pieces, and sewn on my lovely Janome, which can make such fine stitches as to make a doll proud. I made her for a swap, a Shakespeare themed swap, and in making things for the swap, I sort of destroyed the house... Our washing machine broke after felting a bag (since then, I have eschewed felting) and the (rented!) videotape of "Much Ado About Nothing" I watched for details about the dress I had to make for the doll got lodged in the VCR, causing us to have to have the thing repaired... I think we managed to get it out in good condition, in order to return it, but it was a tense night. If you want to check out the Craftster.org post, it is here. There are a few more details on the knitting, as I wrote it when it was more fresh in my mind.